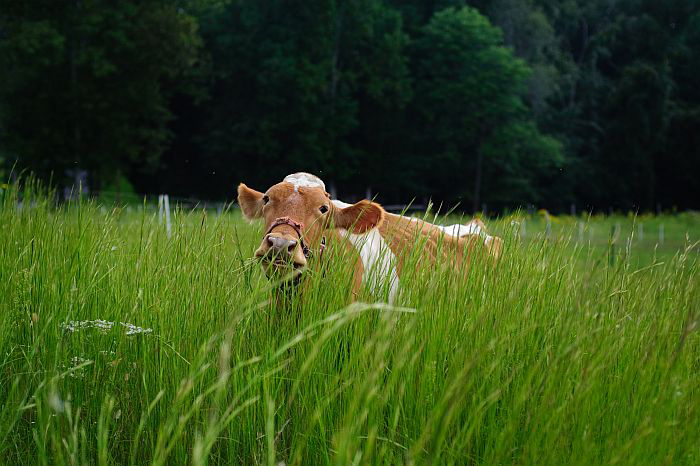 Why grass-fed, A2/A2, raw milk? I mentioned in my last post that we’re on the hunt for a second milk cow and mentioned that we’re searching for a cow with the A2/A2 gene. A friend asked me what the A2 gene was, and I thought this would be a good time to talk about some of the things we’ve learned and are trying to implement with our milking animals. 1.) Pasteurization lowers vitamin content and destroys enzymes. It also completely changes the structure of milk proteins and destroys the beneficial bacteria found in milk. 3.) Pasteurization is not a guaranteed method of protection against food-borne illness. Several people die each year from pasteurized milk and dairy products. E-coli, botulism, Listeria, parasite spores and other bacteria routinely found in pasteurized milk cause illness and death. Not a single death has been reliably reported from raw milk consumption (6). 4.) Studies show that children fed raw milk enjoy a myriad of health benefits including: more resistance to TB (2); more protection against flu, diphtheria and pneumonia (3); better growth and calcium absorption (4); and fewer allergies, skin problems and asthma (5) than children who drink pasteurized milk. Does this mean that all raw milk is safe? No, it doesn’t. All food carries some degree of risk. For our family, however, we believe the benefits outweigh those risks, especially considering that I have daily access to our milk cow and I know exactly how she’s being cared for. I wouldn’t trust raw milk from a large dairy where huge numbers of cows are kept together indoors, and I don’t trust raw milk from cows who are fed large amounts of grain. Which leads me to my next point…. If we were to feed our cow the amounts of grain she was used to in her old home, we could be getting twice the amount of milk from her and wouldn’t need a second cow. If we were to purchase a Holstein from a large-scale dairy and feed her the amounts of grain she’s used to (up to thirty pounds per day!) we could get up to 15 gallons of milk every day! So why wouldn’t we want to feed our cows grain? 1.) Cows are ruminants and were designed to eat grass. “Ruminant animals have four stomachs and are evolutionarily adapted to eat pasture, browse and other plants. When cows are fed grains, the rumen pH lowers, microbes change and the animal’s health (also milk and meat) is adversely affected, and cows eating large amounts of grain can even die.” (13). This cannot be overemphasized. The average lifespan of a cow in a commercial dairy operation is 5 years. After this, they’re often too ill to produce the amount of milk required of them, and they’re sent to slaughter. I have to ask myself: if a cow fed high amounts of grain can become that unhealthy that quickly, how healthy can the milk from a grain-fed cow possibly be? In fact, based on the research I’ve done, I’ve come to the conclusion that raw milk from grain-fed animals is almost as unhealthy as the stuff on the supermarket shelf. If, in the future, our family is ever in need of milk (though I can’t imagine we will be! ), and we can’t find milk from primarily grass-fed animals, we simply won’t drink it. 4.) 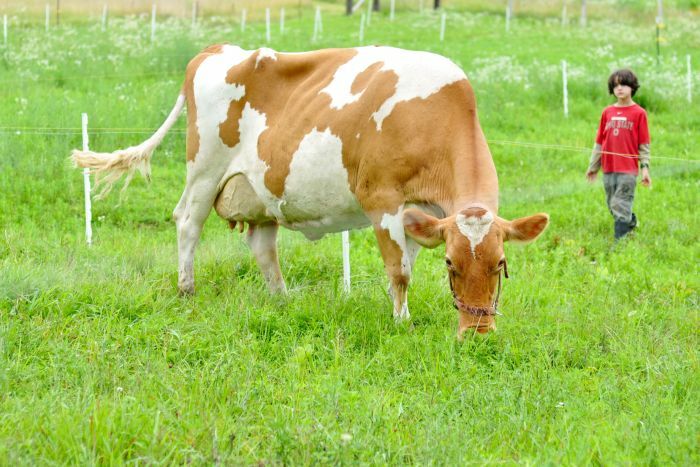 Cows raised on pasture produce far less milk than cows raised on a grain-based diet. Wait, what? Why is this a good thing?! Well, a cow only has a certain number of vitamins that she can transfer into her milk. The less milk a cow produces, the more vitamins are in that milk (I think this is one of the reasons that goats milk has far more vitamins than cows milk. Smaller animal, less milk, more vitamins per glass.) Milk from super-cows bred to produce 10+ gallons a day on 20+ pounds of grain has a higher water content than milk from grass-fed cows, and far less nutrition (12). There are two main forms of cow’s milk protein beta-casein, (known as A1 and A2 beta-casein.) Originally, all cows produced A2 beta-casein, but as the industry started to breed for more and more production, a genetic mutation happened and the A1 form of beta-casein started to show up in dairy cattle. The beta-casein proteins found in cow’s milk are made of a string of 209 amino acids all linked together. The difference between A1 and A2 amazingly is just one of those amino acids. With A1 milk, number 67 is a histidine instead of a proline. (14) Why is this important? BCM7 interferes with the body’s immune response and has been shown to cause neurological impairment, especially autistic and schizophrenic changes, in animals and people exposed to it (16), (17). In animals injected with BCM 7 it has been shown to to provoke type 1 diabetes and heart disease (18), (19). In his book Devil in the Milk, Dr. Woodford presents research showing a direct correlation between a populations exposure to A1 cow’s milk and their rates of heart disease, type 1 diabetes, schizophrenia and autoimmune disease. Now that I’ve established some of the main reasons we have the animal husbandry practices we do, and why we’ve chosen the cow we’ve chosen, you may be asking what you can do about the health and safety of your milk, if you don’t have a cow? First, if you don’t have the time or space for a cow, but are inclined to milk your own animal, you can get a goat! They require a fraction of the space, can be milked once a day instead of twice, and there are a few breeds whose milk doesn’t taste “goaty.” Nigerian Dwarf goats, in particular, have a high percentage of milkfat and their milk tastes great! They can also live comfortably on a third of the land as a standard goat, and will give less milk which is good for an average size family who doesn’t need a gallon of milk every day. Second, you can look for raw milk herdshares available in your area. 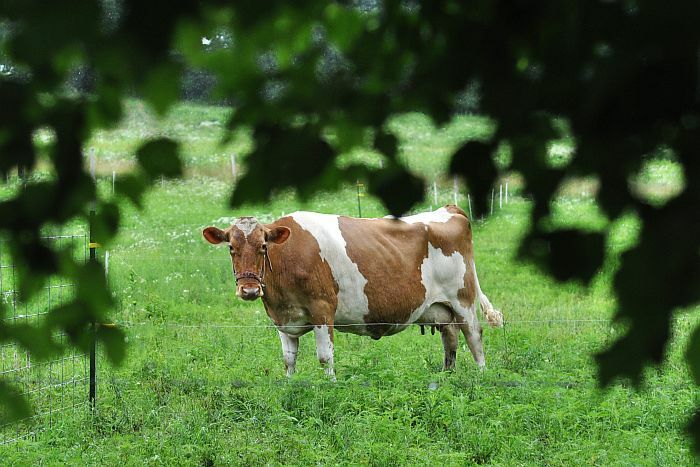 You can visit these farms and ask questions about how the cows are cared for. 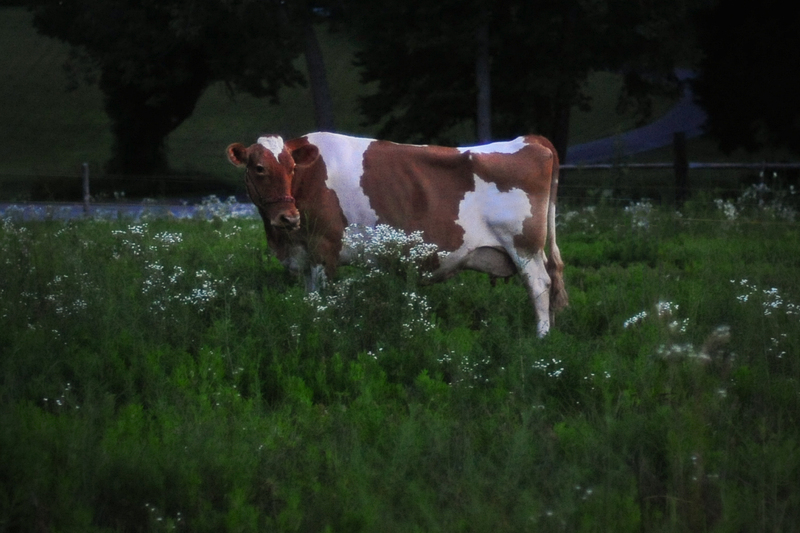 Most people who offer raw milk are passionate about their cow’s health (they’re drinking it, too! ), pasture their cows and feed very little grain, comparatively. It may be tough to find a herdshare program with A2 cows, but it’s not impossible, and as a general rule if you choose a herdshare with Jerseys or Guernseys and stay away from Holsteins you have a pretty good chance of running into an A2 cow. You can also request that the herdshare program test their cows and ask if their breeding program includes plans to convert to an A2 herd in the future. 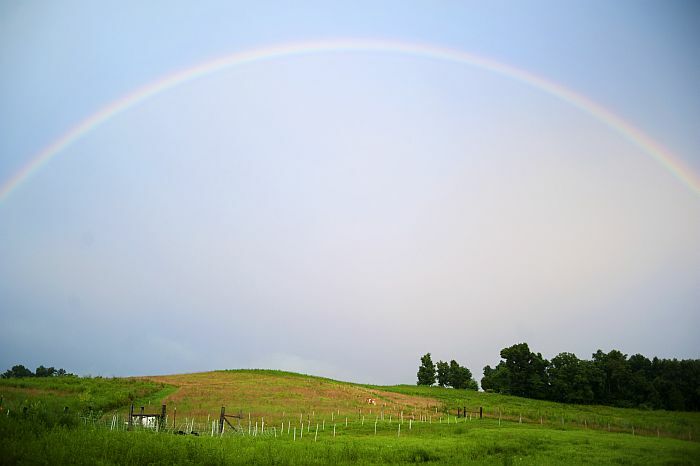 *We are located near Bowling Green, KY. For more info about our husbandry practices and our A2/A2 grass-fed milk cows click Here. 16.) Kost NV, Sokolov OY, Kurasova OB, Dmitriev AD, Tarakanova JN, Gabaeva MV, et al. Beta-casomorphins-7 in infants on different type of feeding and different levels of psychomotor development. Peptides. 2009 Oct;30(10):1854-60. 17.) Cade JR, Privette MR, Fregly M, Rowland N, Sun Z, Zele V, et al. Autism and Schizophrenia: Intestinal Disorders. Nutr Neurosci. 2000;3:57-72. 18.) Elliott RB, Harris DP, Hill JP, Bibby NJ, Wasmuth HE. Type I (insulin-dependent) diabetes mellitus and cow milk: casein variant consumption. Diabetologia. 1999 Mar;42(3):292-6. 19.) Laugesen M, Elliott R. Ischaemic heart disease, Type 1 diabetes, and cow milk A1 beta-casein. N Z Med J. 2003 Jan 24;116(1168):U295. 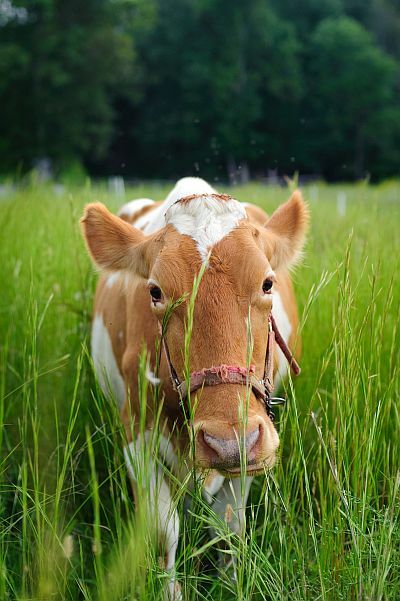 8 Responses to Why grass-fed, A2/A2, raw milk? I absolutely LOVE your pictures of your kids and animals. Especially when they are together! What precious keepsakes.